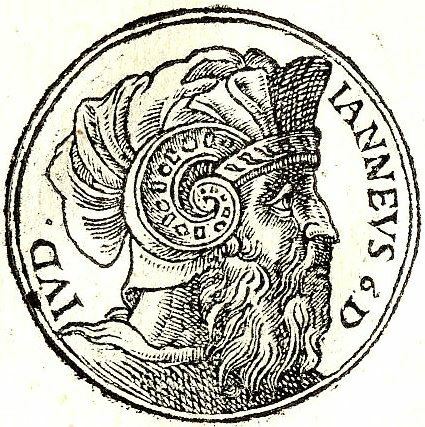 Alexander Jannaeus was the second Hasmonean king of Judaea from 103 to 76 BC. A son of John Hyrcanus, he inherited the throne from his brother Aristobulus I, and married his brother's widow, Queen Salome Alexandra. From his conquests to expand the kingdom to a bloody civil war, Alexander's reign has been generalized as cruel and oppressive with never ending conflict. The coinage of Alexander Jannaeus is characteristic of the early Jewish coinage in that it avoided human or animal representations, in opposition to the surrounding Greek, and later Roman types of the period. Jewish coinage instead focused on symbols, either natural, such as the palm tree, the pomegranate or the star, or man-made, such as the Temple, the Menorah, trumpets or cornucopia. Alexander Jannaeus was the first of the Jewish kings to introduce the "eight-ray star" or "eight-spoked wheel" symbol, in his bronze "Widow's mite" coins, in combination with the widespread Seleucid numismatic symbol of the anchor. Depending on the make, the star symbol can be shown with straight spokes connected to the outside circle, in a style rather indicative of a wheel. On others, the spokes can have a more "flame-like" shape, more indicative of the representation of a star within a diadem.